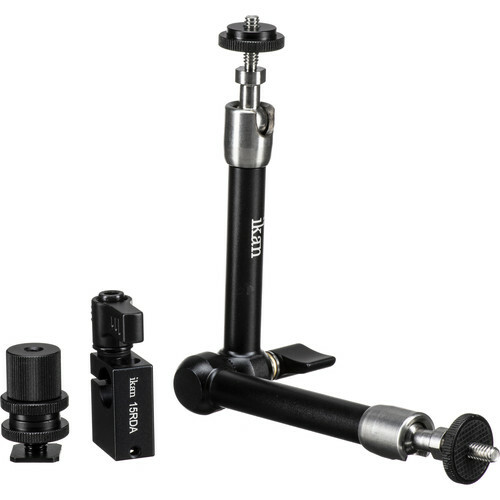 Attach accessories to your camera rig with Ikan's 11" Articulating Arm with Single 15mm Rod Mount. The articulating arm can interface with 1/4"-20 threads and shoe mounts. The added 15mm rod connection allows for the arm to be attached anywhere on a 15mm standard rod. The ikan 11" Articulating Arm for Camera/Monitor is a flexible arm that supports 5 pounds for attaching and positioning available accessories (sold separately) to your camera or accessory mounting point. It is machined from a metal alloy for strength and features three points of articulation that tighten and loosen using a single locking twist handle. The ends of the arm feature 1/4"-20 threaded studs set into ball joints, with each joint providing swivel adjustment and up to 90° of lockable position adjustment. The threaded studs feature thumb wheels that allow you to tighten accessories on the threaded studs. The arm includes a removable shoe mount that attaches to your camera's accessory hot/cold shoe. The ikan 15mm Rod Adapter is a mounting block that slides onto any industry-standard 15mm support rod. Its 1/4"-20 and 4mm screw threads allow you to attach additional accessories such as monitors, batteries, or lights to an Elements support rig. Box Dimensions (LxWxH) 9.65 x 4.0 x 1.15"
Box Dimensions (LxWxH) 4.5 x 2.2 x 0.8"